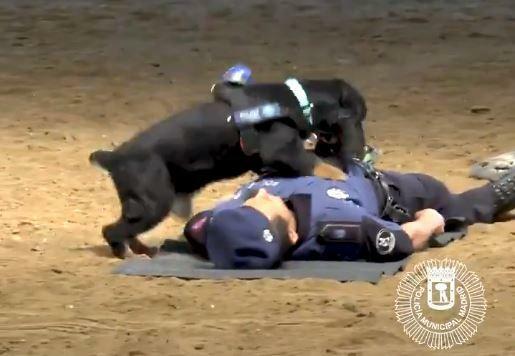 Poncho, a police dog in Madrid, has become an internet sensation after a video showing him appearing to perform CPR (cardiopulmonary resuscitation) on his handler went viral. Poncho was taking part in a first aid awareness event for elementary school kids visiting a Madrid police headquarters. The video has been viewed more than 2 million times since it was published on the Madrid police's twitter account on June 22. In the accompanying message, the police playfully note that "heroic" Poncho "didn't hesitate for even an instant to 'save the life' of the agent" pretending to be unconscious. The eight-year-old cocker spaniel doesn't perform CPR in real life, the police made clear, but his performance was a fun way to explain to children how first aid can save lives. "Heroica" actuación de nuestro #Compañerosde4Patas Poncho, que no dudó ni un instante en "salvar la vida" del agente, practicando la #RCP de una manera magistral. When on duty, Poncho detects explosives and is trained to follow laser lights to know where he should search. Madrid police also included a quote in their tweet, by 19th century American writer Henry Wheeler Shaw, who used the pen name Josh Billings: "A dog is the only being in the world that will love you more than it loves itself," followed by the hashtag, #adopt.